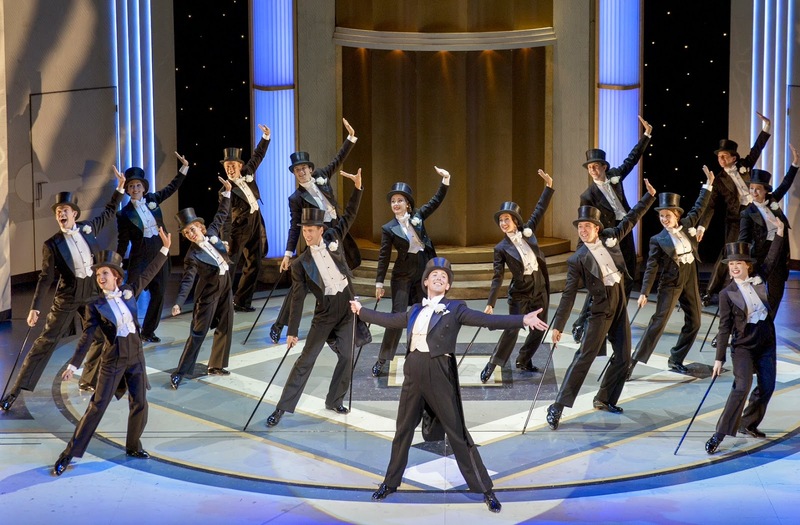 "Musical Comedy" sounds like a rather out-dated phrase these days but is an apt term for the rapturous, effervescent production that is "Top Hat" which won the Laurence Olivier Award for Best New Musical in 2013. It is hard to dislike such an upbeat production, although those with a dislike for tap-dancing may wince here and there, and there is much to enjoy in this elating musical. The plot revolves around American performer "Jerry Travers" (Alan Burkitt) who journeys to London to star in a new show produced by "Horace Hardwick" (Clive Hayward). Once in London his tap-dancing above the hotel room of "Dale Tremont" (Charlotte Gooch) wakes her and she promptly rushes upstairs to complain, whereupon he falls in love with her. A case of mistaken identity follows and "Jerry" must follow "Dale" to Venice in order to win her heart. The plot may be quite thin but it is blessed with sharp and humorous dialogue and elicited many a laugh from the audience. The adaptation by Matthew White and Howard Jacques from the original RKO film is spritely, full of wit and consistently entertaining. As director, Matthew White has constructed a staging that is never lazy or uninteresting to the eye and together with choreographer Bill Deamer he creates some truly wonderful moments onstage including an excellently executed form of 'shadowing' which is used to great effect. It is no wonder that Deamer won the Olivier Award for his choreography as it is simply beautiful to watch and executed precisely. Each number is performed by the strong ensemble who work together uniformly, creating extravagant musical numbers not too often seen these days. The ensemble are even used as part of the transitions between scenes thus creating a smooth fluidity to the show. The entire production exudes class and elegance; the set design of Hildegard Bechtler encompasses beautiful art deco scenery and natural imagery and creates a cinematic quality to proceedings allowing smooth scenic transitions and swift changes with sleekly moving architectural screens; The costumes of Jon Morrell compliment the scenery effortlessly and are beautiful in themselves and Peter Mumford's lighting is stylish and adds another depth to the onstage imagery imbuing the stage with evocative colours. The musical score is, of course, by Irving Berlin and boasts some of his most famous numbers including "Puttin' on the Ritz", "Let's Face the Music and Dance" and "Cheek to Cheek" and is expertly directed by Jae Alexander. The orchestrations by Chris Walker accurately replicate the sound of the 1930s jazz score and is another element that adds to the authenticity of the whole. My only quibble with the orchestra is that in some of the more string-heavy sequences I thought I detected a synth which intruded upon the faithful sound of the orchestra. Gareth Owen's sound design is encompassing and appropriately allows the tapping to become another instrument of the soundscape. 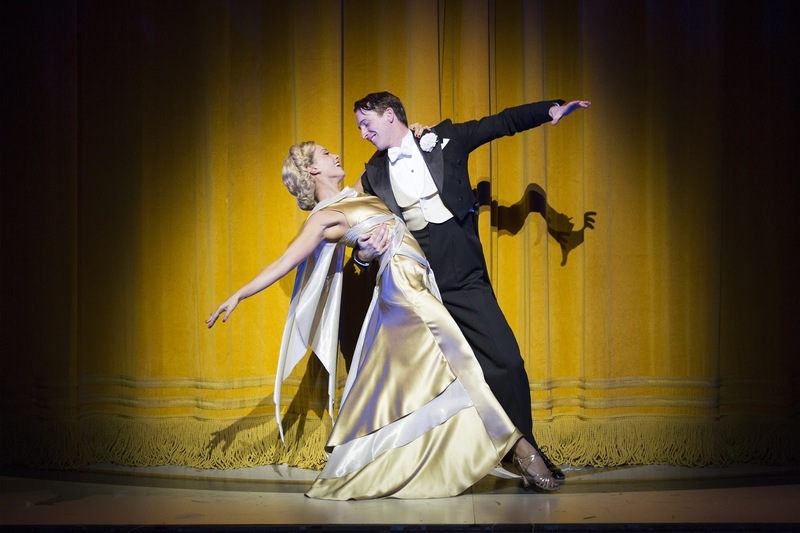 Alan Burkitt and Charlotte Gooch are excellent in their roles and are a joy to watch. Their vocals also echo the sound produced by singers of the 1930s, a touch that lends credence to their performances which are consistently exciting and alive. Clive Hayward as "Horace Hardwick" and Rebecca Thornhill as his wife, "Madge", are also perfectly suited to their parts with Thornhill getting some wonderful lines which she plays for all they're worth! Amongst the funniest performances of the evening were those of John Conroy as trusted valet, "Bates" (who becomes a 'master' of disguise throughout the evening and who offers many familial quotes to live by along the way), and Sebastien Torkia as Italian designer, "Alberto Beddini", who almost steals the scenes he's in of act 2. There are a number of moments that the show can claim as highlights but, perhaps, the most quintessential is the musical number "Cheek to Cheek" (more commonly known as "Heaven") which is an utterly entrancing and beautiful sequence. A total joy to experience, "Top Hat" is a perfect example of a jubilant night out at the theatre and one could do far worse than see this happiness-inducing production.